I want to welcome Deena Remiel to Books R Us. Deena is the author of Ghost of a Chance (Paranormal Romance). Thanks for stopping by. Contest ends on 10/30 @ 11:59pm Eastern. Winner will be chosen by Random. Org and will have 48hrs to respond to the email or a new winner will be chosen. Following Books R Us on Twitter. Like Books R Us on fb as Eli Carver. Following on twitter as PennyMindingMom. I follow Books R Us via GFC. I like Books R Us on FB. 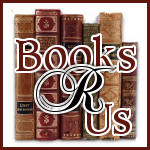 I follow Books R Us on twitter @raisingmybabies. I like Charming Adornments on FB.